Named after the ring of elevated train tracks that encircle it, this is downtown Chicago’s core, and the city’s financial and governmental hub. Abuzz with laptop-toting business folk during the week, the Loop is transformed on weekends when a veritable shopping frenzy erupts along its famous State Street. Those thirsty for culture also come flocking to view the area’s many architecturally significant buildings and notable public art. A recent infusion of corporate dollars has given the Loop a real boost: the resulting restoration of old theaters and the promotion of the theater district has lured in more visitors, and the many great bars and restaurants that have sprung up mean that the area now offers a burgeoning nightlife. Setting a trend for public artwork Downtown, Pablo Picasso’s untitled sculpture, simply known as “the Picasso,” was donated to Chicago in 1967. The Loop’s street corners now accommodate more than 100 sculptures, mosaics, and murals by both established and upcoming artists. 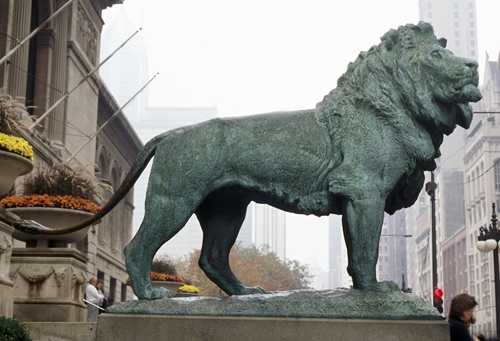 A guide to the open-air artworks – the Loop Sculpture Guide – is available from the Chicago Cultural Center. Borrow piano sheet music at the Harold Washington Library and tickle the ivories in one of the six free-to-use practice rooms. This extraordinary collection of exhibits spans over 4,000 years of international art, much of it donated by wealthy Chicago collectors . An architectural superlative, the tower offers breathtaking bird’s-eye views from its 103rd floor Skydeck, where you’ll find yourself standing on top of 76,000 tons of steel . Built in 1897 as the city’s first main library, this magnificent Beaux Arts building was described at the time as the “people’s palace.” In 1991, the library moved out, allowing several galleries, performance spaces and a visitor information center to move in. Guided tours offer a historical overview of the building, which occupies an entire block and features one of the world’s largest domes, designed by L. C. Tiffany, and rooms modeled after the Doge’s Palace in Venice and the Acropolis in Athens. Originally called the Union Loop, this system of elevated trains came about after the 1871 Great Chicago Fire when the city was rebuilt with such unexpected success that, within 20 years, its streets could no longer handle the influx of people, streetcars, and horses filling them. Today, three lines ring the business district – the Orange, Purple, Pink, and Brown lines – with three others connecting it to destinations farther afield . Named after former city Mayor Harold Washington, Chicago’s first Afro-American mayor , this is the largest public library building in the country. Its collections, which include a superlative Blues Archive and a vast children’s library, fill an incredible 70 miles (110 km) of shelving. 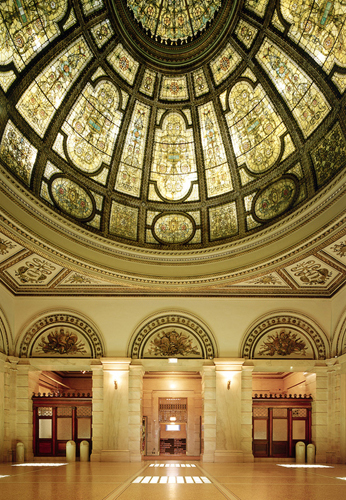 Architects Hammond, Beeby, and Babka incorporated architectural elements of several Chicago landmarks, such as The Rookery and The Art Institute in the building’s design: don’t miss the ninth-floor Winter Garden atrium, which soars two stories to a spectacular glass dome. The Chicago Board of Trade (CBOT) was founded in 1848 to create a central marketplace in the fast-developing city, and moved to its current 45-story home in 1930. Designed by Holabird and Root, this landmark building is a stunning example of Art Deco. Capping the majestic limestone building is a huge statue of Ceres, the Roman goddess of grain and harvest. 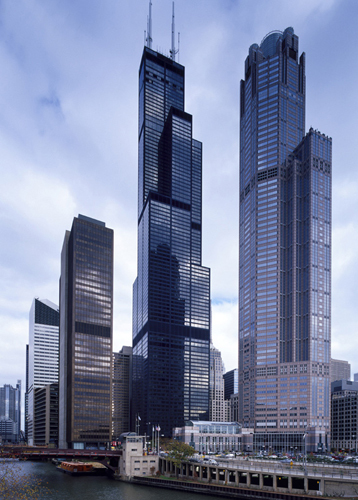 A glittering 23-story glass-and-steel addition designed by Helmut Jahn was completed in 1980. This “great street” got its nickname from the 1922 hit song Chicago. Although it didn’t always live up to this catchy moniker, it has won back many fans since its multi-million-dollar face-lift in 1996. It now sports replica Art Deco lampposts and subway entrances, and was listed on the National Register of Historic Places in 1998. 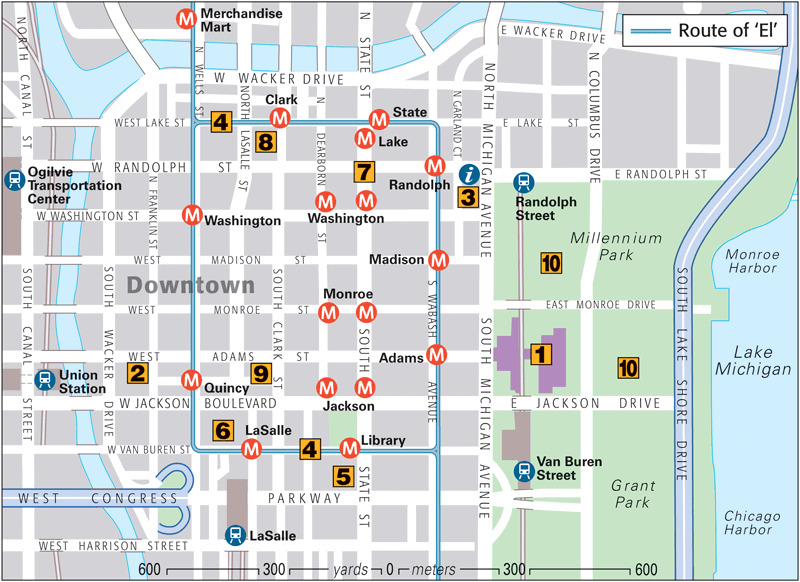 This dynamic stretch has it all: shopping, history, education, architecture, theater, and dining. The atmosphere is especially merry during the run up to Christmas, when the Thanksgiving parade brings Santa to town, and department stores like Macy’s fill their windows with elaborate and imaginative decorations. Also known as the State of Illinois Center, this striking 17-story, steel and granite structure shimmers with 24,600 curved glass panels. 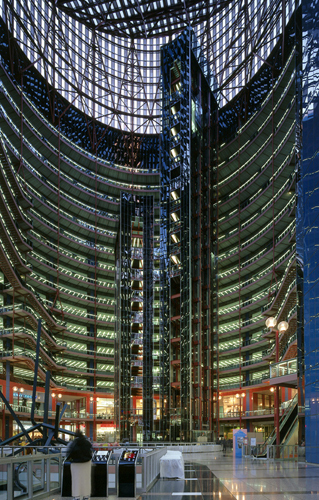 Helmut Jahn designed the controversial 1985 building to be a democratic fusion of government offices and public spaces, such as shops, restaurants, and art galleries. The soaring skylit atrium is sliced by internal glass elevator shafts and contains unusual, see-through escalators. Outside, the plaza features the intriguing 1984 sculpture Monument with Standing Beast by Jean Dubuffet. This 11-story building, with its rusticated red granite base, was the country’s largest office building and a precursor to modern skyscrapers when it was completed in 1888 by Burnham and Root . Its stunning skylit lobby was redesigned in 1907 by Frank Lloyd Wright , who added a grand staircase and hanging light fixtures, both of which carry his signature circle-in-square motif. The building’s unusual name refers to the rooks that once roosted at the site. The modern Millennium Park is Chicago’s superb new adaptation of its “front yard”. The park is home to a dynamic Frank Gehry-designed music pavilion and pedestrian bridge, and a vast sculpture by British artist Anish Kapoor. It also boasts lush gardens, restaurants, a winter ice rink, peristyle, and an interactive fountain by Spanish artist Jaume Plensa. The adjoining Grant Park hosts many summer festivals including the Taste of Chicago. 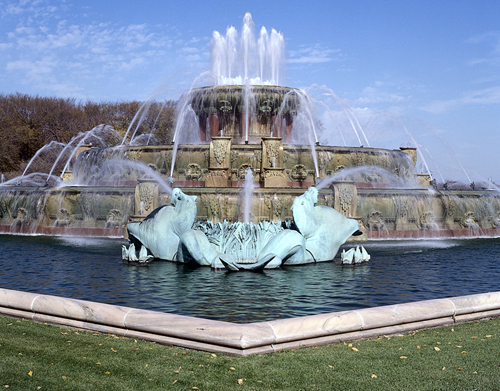 It is also home to Museum Campus , the Art Institute of Chicago, and the ornate 1927 Buckingham Fountain.